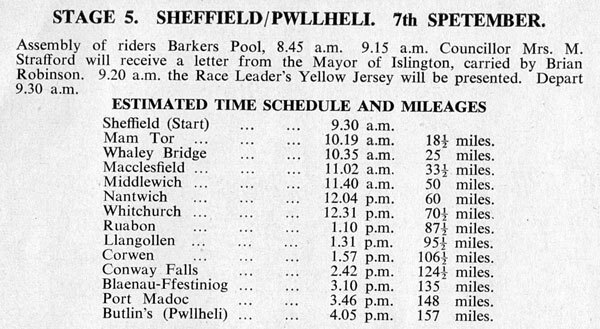 Despite everything going wrong with the sport’s administration, Britain managed to have a range of stage races in place by 1955. 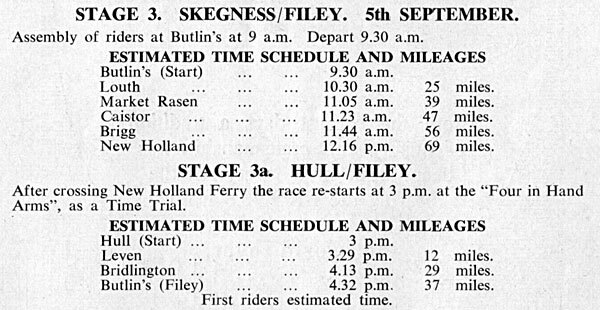 The top event remained the Tour of Britain - but the Amateur Circuit of Britain was still a major 9 day day race with the backing of the Quaker Oats brand name. So first to be covered is “The Tour” (below) and then “The Oats” later. First it’s OFF - Now it’s ON! THERE'S an "Off-on" quality about this year’s Tour of Britain. Last week the "News Chronicle” scooped the "Daily Express” in announcing that the 1955 was "off". Twenty-four hours later the “Express" confirmed that it would not be sponsoring the Tour, mentioning the present political differences between the sport's controlling bodies. But after its meeting on Sunday, the British League of Racing Cyclists' Management Committee sparked the Tour of Britain into life again by announcing, "We will run the Tour this year". "To keep faith with B.L.R.C. members and to ensure the continuity of the Tour of Britain, the B.L.R.C will run the event in 1955," it was stated. Asked by THE BICYCLE whether the B.L.R.C. Tour would be in addition to the Amateur Circuit of Britain. chairman Eddie Lawton said," Quite definitely." The race - not necessarily a 14-day affair - will be open to professionals and/or independents. The date and route have yet to be fixed. Said Mr. Tom Blackburn, general manager of the "Daily Express", announcing his company's decision not to sponsor the 1955 Tour: "With the three controlling bodies unable to reach agreement we have decided against holding the race this year. Even if the national bodies got together now, there would be insufficient time for the “Daily Express" to organise the event this year in the way and on the scale on which we should like to see it put over." Cancellation of the "Daily Express" Tour of Britain would provide the opportunity for a big professional road race in the Isle of Man, Week programme, with which the "Tour" clashed. But THE BICYCLE was told last week by a leading Manx official: "The possibility of staging an important professional race is always an attractive proposition, but many factors, including the disharmony among the controlling bodies, have to be overcome first." 24. The end of the fortnight's race will come as a climax to the annual Isle of Man Cycling Week. Announcing this last week, the N.C.U. stated that arrangements were in hand for riders, officials and the race caravan to be shipped across the Irish Sea. THE BICYCLE understands that the Manx authorities will provide financial assistance to help cover the cost of this miniature armada. The. last day of the Tour will not be confined to the 37 3/4 mile mountain circuit. The course will take in southern parts of the island to bring the stage distance up to the 100-mile mark. The Tour of Britain, open to national professional and independent teams, starts on June 11 - probably from London. I am amazed at the recent decisions of the N.C.U., first in announcing a Tour of Britain in competition to that of the B.L.R.C., and then abandoning the whole idea. The competitors in our sport have suffered long enough, but my comment is from a rather different angle - that of the spectator. Following the announcement of a Tour of Britain finishing in the Isle of Man, my friends and I went to quite a bit of trouble booking holidays and arranging travelling and accommodation, only to be disappointed. I hope those who have arranged their holidays to watch a British team in the Tour of France will not be similarly disappointed by some official decision. Our riders on the Continent are showing great promise, and hopes of British participation in international events on at least equal terms are high. All of us, officials and clubfolk alike, owe it to these riders to see that their efforts are not nullified by official instability. To-day one views the cycling game in an extraordinary light. The riders and club members support three different bodies. At district level the same officials are working for these three bodies. I believe the formation of an overall body is being obstructed by no more than a dozen 'top-line' officials. As a member of the London Centre N.C.U. Professional Racing Committee I was surprised and disappointed to read the announcement that the N.C.U. had abandoned the Tour of Britain. This is particularly unfortunate at the present time, when our riders are putting up such a good show abroad and when, for the first time in the history of British cycling, a team 100 per cent. British will be competing in the Tour de France. An opportunity to see these riders at home is particularly desirable. Mr. Foster stated in his letter to the Editor of THE BICYCLE that over one half of the necessary support had been raised for the Tour, -and bearing in mind the importance of maintaining continuity of promotion, it surely should have been possible to continue with the organisation, even if on a reduced scale. I read that the B.L.R.C. is now organising a Tour of Britain, and even if this does not reach the scale of previous tours, it does demonstrate the League's approach to this subject as being more positive than that of the N.C.U. The act of abandonment is hardly in keeping with the N.C.U. statement of its intention to promote a full programme in 1955. This volte-face, together with the abandonment of the Leamington Rally and the loss of the Welsh National Championship event, all within the space of two months, is no answer by the “controlling body" to the ambitious and extensive programmes offered by the B.L.R.C., which- have, incidentally, included the initiation and promotion of the Tour of Britain since 1951, together with other major events over the past years.